LYMPHATIC filariasis, commonly known as elephantiasis, currently affects over 120 million people. According to WHO, approximately 65 per cent victims are from Southeast Asia, 30 per cent from Africa and the remainder from other tropical areas. A new study has come as a ray of hope for the patients suffering from the painful and profoundly disfiguring disease. The study claims to have reduced elephantiasis cases by employing a new therapeutic approach called home-based self-care integrative treatment, combining ayurveda, yoga and modern dermatology drugs in districts of Kerala. The findings were published in Acta Tropica in June. “The communitybased, one-day camps that trained lymphatic filariasis patients on skin care and daily yoga improved their quality of life,” says lead researcher Madhur Guruprasad Aggithaya of the Institute of Applied Dermatology, Kasaragod, Kerala which conducted the study. Patients of elephantiasis can barely walk as their legs swell due to abnormal fluid build-up. The disfigured legs bear pus-secreting wounds and repeated bouts of fever weaken the patient. Over 90 per cent cases of the disease are caused by Wuchereria bancrofti, a roundworm transmitted to humans by Culex and Anopheles mosquitoes. Deformities associated with the disease lead to social stigma as well as financial hardship from loss of income. The researchers devised the affordable self-care integrative treatment keeping in mind the socioeconomic status of elephantiasis victims in Alleppey, Calicut and Kasaragod, the three endemic districts of Kerala. 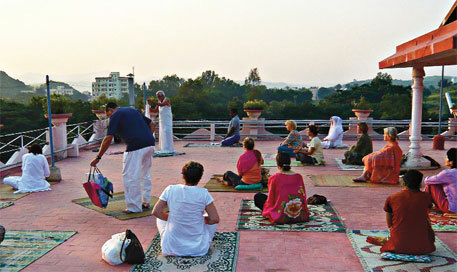 Besides training the patients at one-day camps, booklets that described the disease in regional language, essential skin care, soap and water wash, drugs for bacterial skin infections and instructions on simple yoga exercises and pranayama were provided to the patients and their family members. After the camps, the trained patients and their family members were asked to pursue the integrative treatment at home for six months. After that home visits were done to check the patients’ condition. They were given a set of questions to assess their quality of life before and after the integrative treatment. The questions were on mobility, self-care, pain or discomfort, usual activities, psychological health, social participation and signs and symptoms of elephantiasis. Out of 446 patients who attended the one-day camps, 425 reported an improved quality of life. Severity of inflammatory episodes in these patients also reduced from severe to none after six months of home-based self-care. “In absence of a nationwide public health programme, this treatment can be replicated with the active participation of government health officials to manage lymphatic filariasis patients,” says Aggithaya. This treatment, he adds, can be extended to other skin diseases, like psoriasis, as well.